Ready, set… and off they go in the fun number and color rally! But of course they first have to give way to the stop sign. Then the balls race in turn along the steep ball curve and land one after the other – 1, 2, 3 – in the ball collector. The fourth ball, however, simply rolls over the others and causes the downfall of the numbers one after the other. 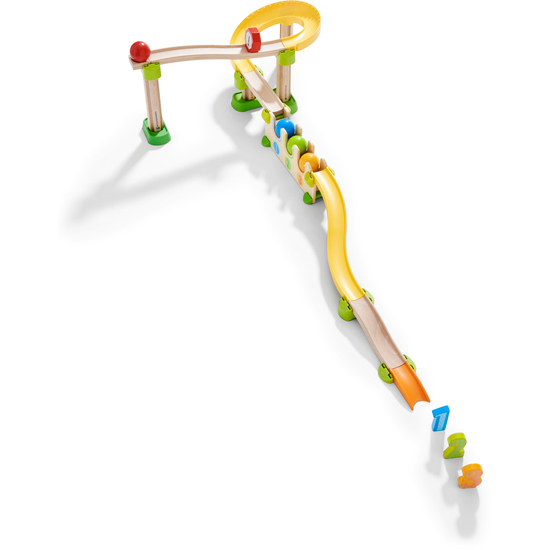 Contents: 1 effect ball collector, 4 balls, 3 numbers, 1 stop sign, 1 start block, 1 momentum ramp, 2 ramps, 1 straight track, 1 steep ball curve, 4 columns, 1 exit ramp, 8 connecting elements.